Seared Scallops with Bacon - easy seared scallops with crispy bacon bites in butter and lemon. Succulent, juicy, restaurant quality and much cheaper! I love scallops, especially seared scallops. There is nothing not to love about them, so tender, juicy, succulent and briny, except the price tag when you eat out at restaurants. Homemade seared scallops are so much cheap as you get 10x more in quantity. Scallops are very easy to make at home. All you have to do is searing them; in this seared scallops with bacon recipe, you use bacon to complement the flavors of the scallops. As scallops are naturally delicious so all you need are some salt and ground black pepper, a squirt or two of fresh lime juice, some parsley and you have restaurant quality seared scallops. The best thing is you get so much more instead of two pieces at restaurants. 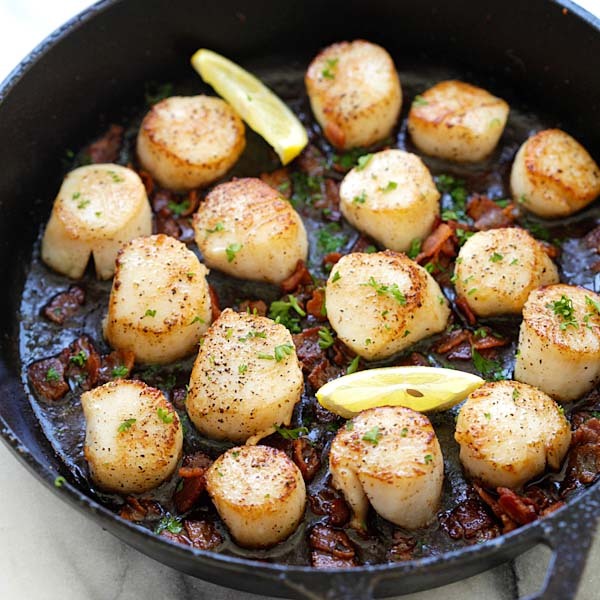 Seared Scallops with Bacon – easy seared scallops with crispy bacon bites in butter and lemon. Succulent, juicy, restaurant quality and much cheaper. Remove the ligaments attached to the side of the scallops. Rinse and pat dry with paper towels. Season both sides of the scallops with salt, black pepper and cayenne pepper. Heat up a skillet (cast-iron preferred) on medium heat and cook the bacon until the fat renders out and they become golden and crispy. Remove the bacon from the skillet but keep the bacon fat in the skillet. Transfer the scallops to the skillet and pan sear each side for about 1 minute or until the surface turns crisp and golden brown. Turn to the other side and repeat the same. Add the bacon back, and squeeze some fresh lemon juice on top of the scallops. 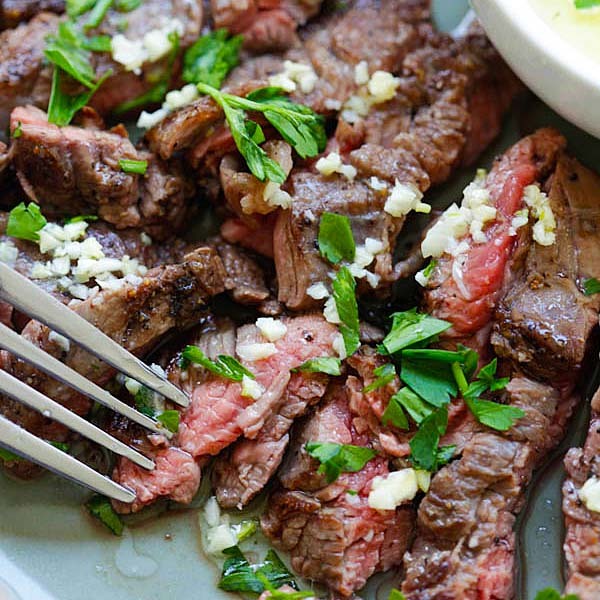 Top with the chopped parsley and serve immediately. All photos and recipes on Rasa Malaysia are copyright protected. Please do not use the photos and recipes without prior written permission. If you wish to republish this recipe, please rewrite the recipe in your own words instead of copy and paste and link back to //rasamalaysia.com/seared-scallops-with-bacon/. Thank you very much! Thanks Sara, yes I love scallops, too. Omg, these photos look fantastic. I bet these are super delicious! 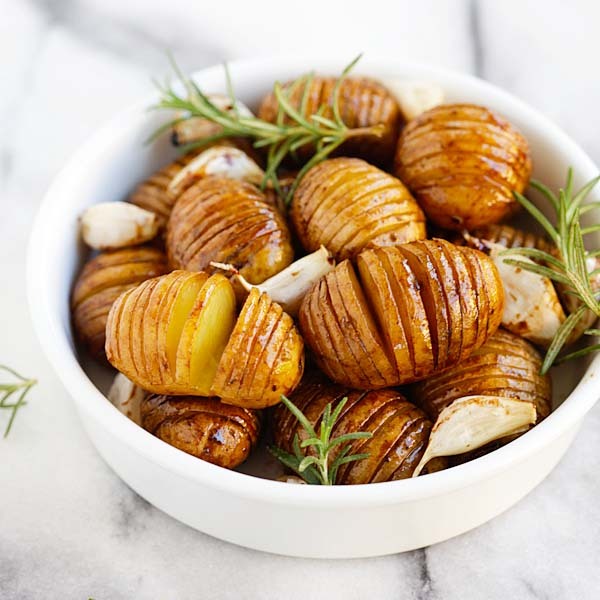 Thank you for posting the recipe, I’m definitely going to try it soon. Made this Friday night, my husband raved about how good it was and so then we made them Saturday! 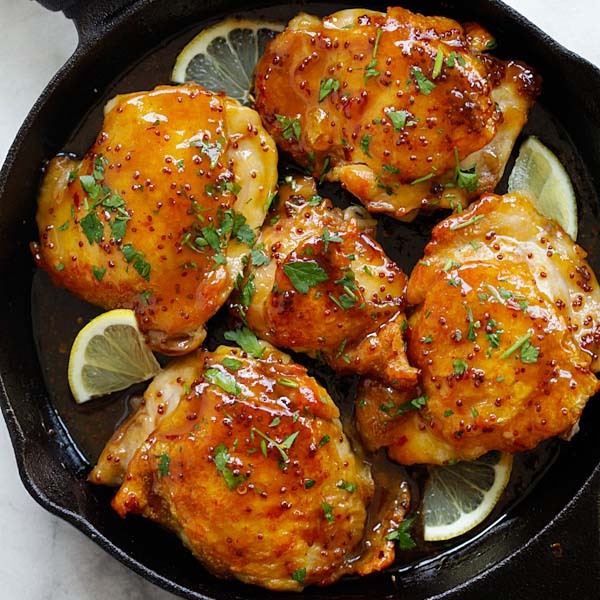 So easy and soooo delicious!